Light, mobile and enduring - that is not only the trend in the consumer segment where the so-called ultra-mobiles did once more exceptionally well in 2013 with high double-digit growth rates. 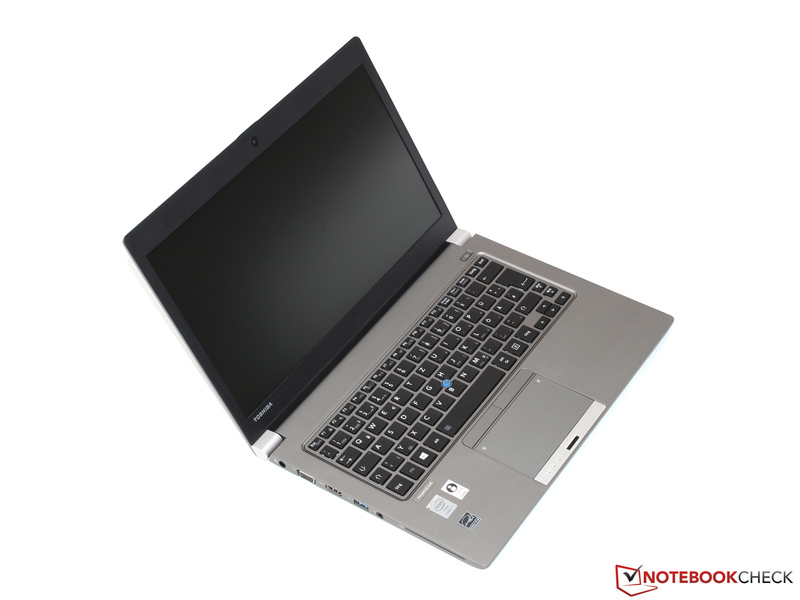 Simultaneously there are a likewise steadily growing number of especially portable business notebooks, which try to canvass solvent business customers with additional features such as comprehensive security equipment. 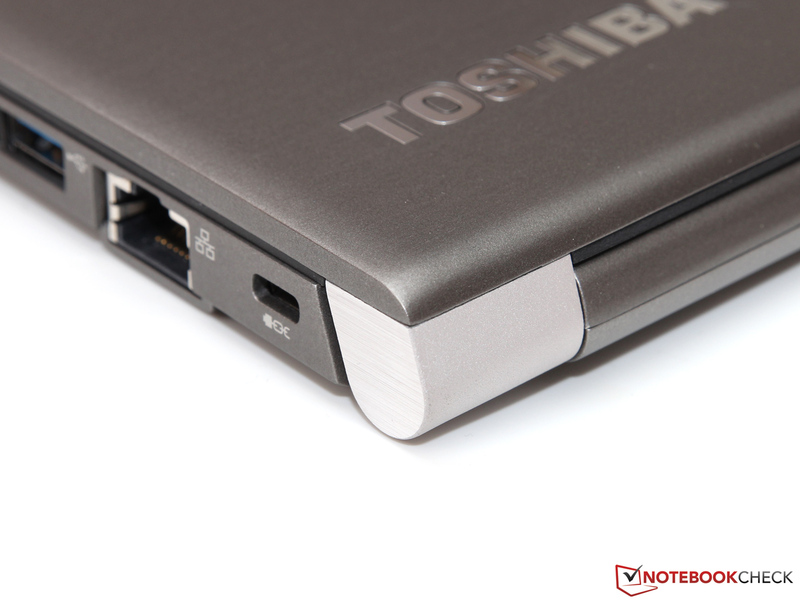 This is also exactly the target group of the Toshiba Portégé Z30. 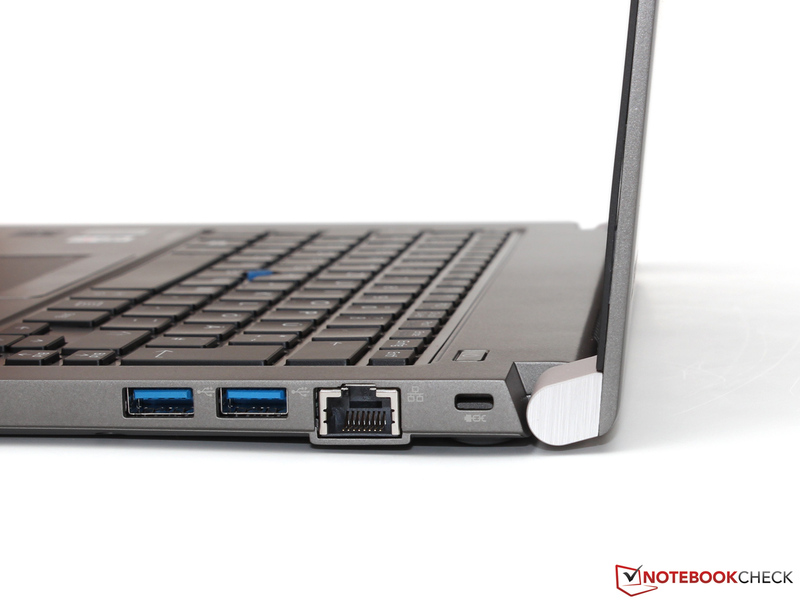 Those who order the delicate 13-incher with the top configuration for about 1,500 Euros (~$2038) can look forward to a Core i7-4500U, which is based on Haswell, sumptuous 16 GB RAM and 256 GB SSD. About 300 Euros (~$408) less are demanded for the slightly more weakly equipped basic version, which has to get by with a Core i5 processor and less memory (4 GB RAM, 128 GB SSD). All other equipment features such as the matte WXGA display, the support of the fast 802.11ac wireless data transmission as well as the two operating systems, which are included in the scope of delivery (Windows 7 Professional and Windows 8.1 Pro) are, however, identical for both models. 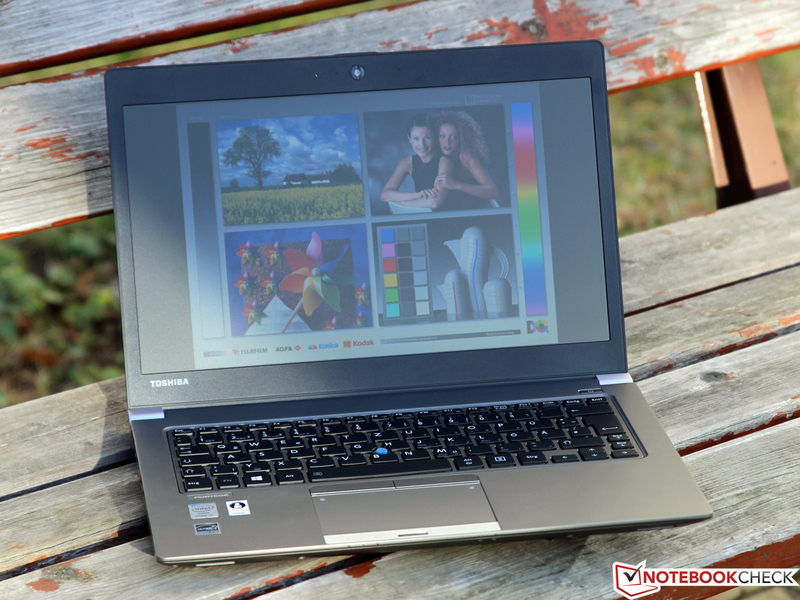 The competition for the Portégé Z30 includes, among others, the Lenovo ThinkPad X240 as well as the HP EliteBook 820 G1 (review will follow), which are, however, shipped with a slightly smaller display in the 12.5-inch format. 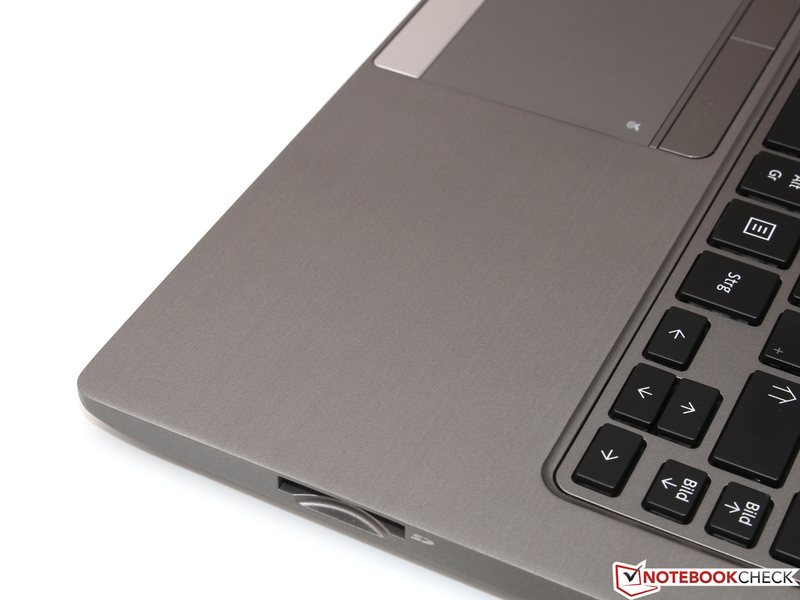 It is not easy to design a notebook as thin and light as possible without affecting the stability negatively. 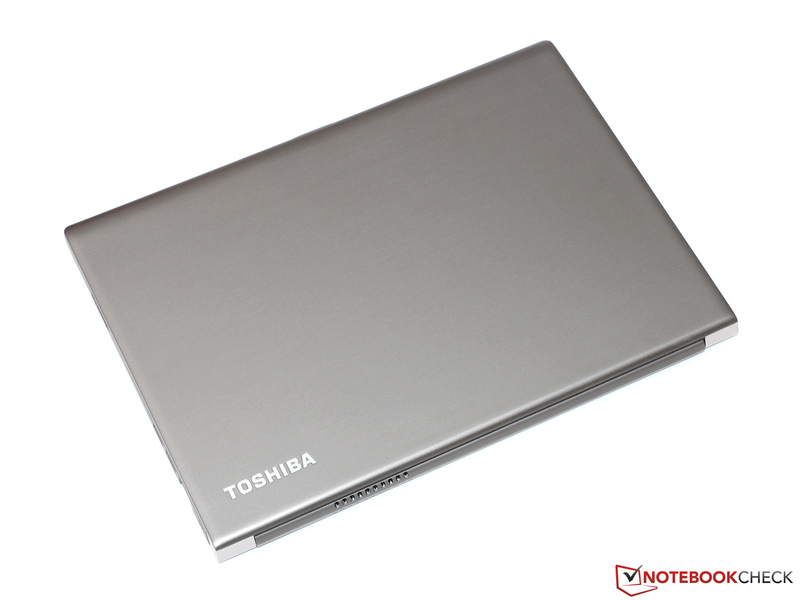 Many notebook manufacturers therefore rely on light metals like aluminum; Toshiba even goes the extra mile and makes the chassis out of a special magnesium alloy that promises an especially high weight reduction. Our scale proves that this effort pays off: At 1.2 kilograms the Z30 is merely 100 grams (~2.6 pounds and ~3.5 ounces respectively) heavier than a current, significantly smaller MacBook Air 11. Despite this crash diet the case appears to be unimpressed by selective pressure and, according to Toshiba, is supposed to withstand a fall from 76 centimeters (~2.5 feet) without a scratch. We admittedly did not dare to put this statement to the test, but our subjective impression confirms the quality of the construction. Small deductions are only given for the just moderately torsion-resistant display, which is mainly attributed to its small thickness of about 4 millimeters (total height with basis: 17.9 millimeters; ~0.7 inches). The outstanding hinges, which operate both extremely precisely and pleasantly effortlessly, make up for it. In addition to that, they allow opening the notebook with one hand. To conclude this section we would like to emphasize the flawless workmanship as well as the quality feel of the entire device - despite the fact that this should actually be self-evident in the price-range of way above 1,000 Euros (~$1359) anyway. All in all the Z30, therefore, receives just barely, but nonetheless deserved, a very good partial rating. To live up to expectations of a professional business device the Portégé offers a solid selection of the most important interfaces. 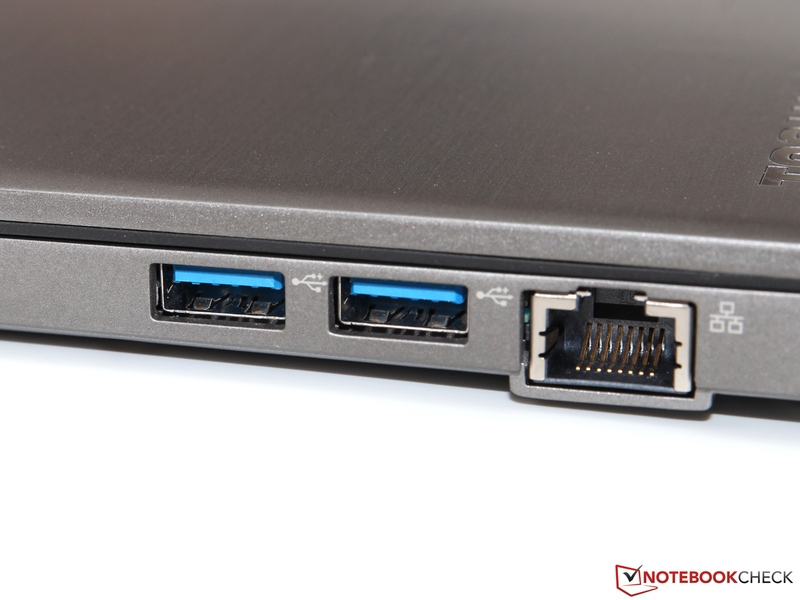 These not only include three fast USB 3.0 ports but also two display outputs (VGA and HDMI) as well as Gbit LAN. The absence of a DisplayPort, which is often obligatory for high-resolution monitors, is unfortunate, but can be fitted via a docking station (Hi-Speed Port Replicator III, about 220 Euros (~$299)) if required. 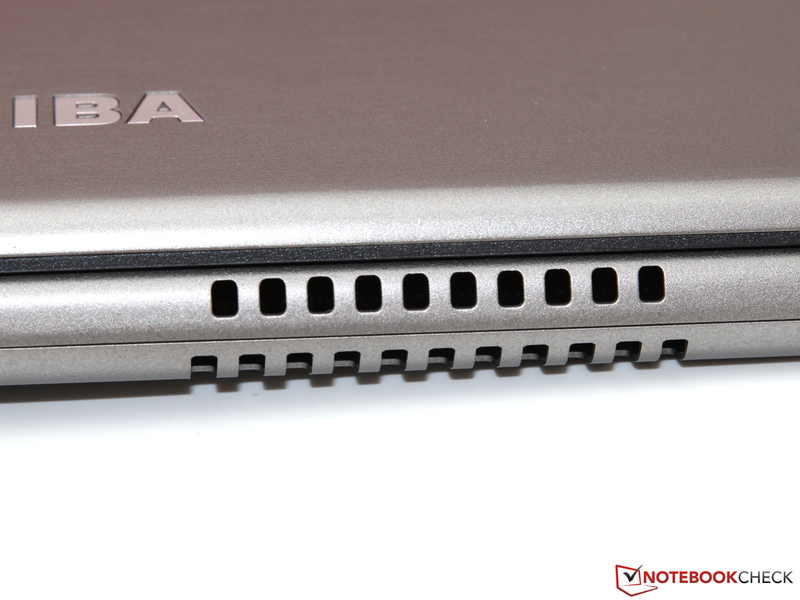 Toshiba decided to distribute the connections on the left and right side of the case since the display mechanism would block any interface at the back side. In principle, the chosen layout is acceptable, although we would have wished that the headset jack, for example, was placed a little bit closer to the front side of the device. Intel's wireless adapter Wireless-AC 3160 has only recently been introduced to the market and is essentially the small brother of the top model Wireless-AC 7260. As the name already reveals, both versions are capable of the current WLAN standard 802.11ac (as well as the predecessor 802.11a/b/g/n and Bluetooth 4.0). However, they differ in terms of speed and features. Due to the restriction to single stream transfers, the Wireless-AC 3160 achieves a maximum gross data rate of "only" 433 Mbit/s and furthermore has to do without vPro certification. After all: Wireless Display is also included in this model. Unfortunately, an integrated WWAN module for UMTS or LTE connections is generally not offered. With its 2.0 megapixels the webcam, which was mounted in the upper display frame, allows pictures and videos in Full HD resolution. Subjectively the increase in quality in comparison with the usually customary 720p sensors is not exactly world-shaking; however, it is sufficient for Skype and similar applications. In most cases the user can put the external headset aside - the integrated array microphone scores with its magnificent speech discrimination. Among the previously mentioned safety features of the Portégé Z30 are, for example, a fingerprint scanner, a BIOS with Computrace support, a Smartcard reader as well as a Trusted Platform Module (TPM). The Kensington lock fixture, which is supposed to prohibit physically stealing the entire device, is part of the standard equipment in most of the notebooks anyway. We have collected more detailed information about the individual technologies in a special article. Ex works, the Z30 comes with Windows 7 Professional preinstalled, which can be replaced by the also accompanying Windows 8.1 Pro if the user wishes so. Further software extras encompass various system tools (Eco Utility, PC Health Monitor) as well as a test version of the antivirus software McAfee Internet Security. The packaging of the notebook does not contain more than the duster, several brochures and the appropriate power supply. To open the bottom side 13 screws, of which three are hidden underneath the center and the two rear feet, need to be loosened first. Subsequently the big base plate can be removed to have a close look at the hardware. 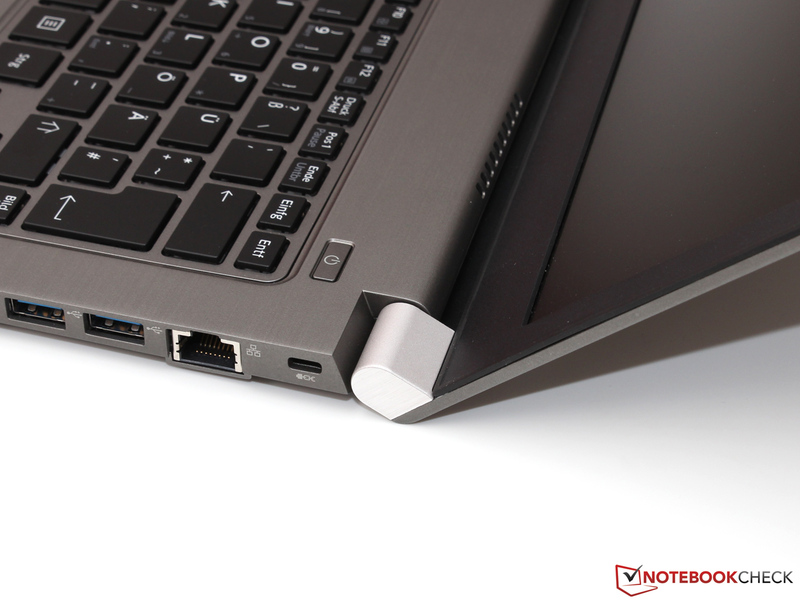 Unfortunately, the notebook does not feature free slots; however, several components can be replaced easily: RAM, SSD, WLAN module and battery are merely either inserted or screwed and can be removed in just a few steps. 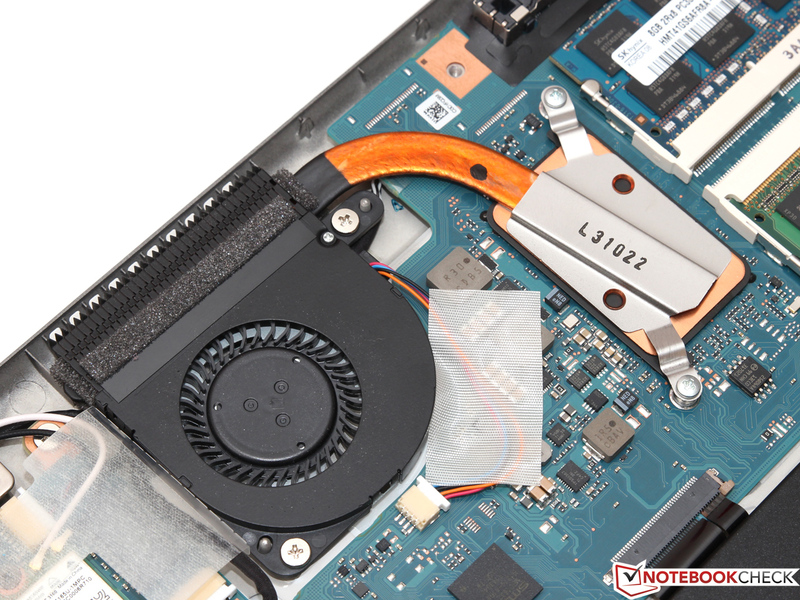 Fan and heat sink can easily be freed from accumulated dust. While many competitors in this range grant a 2- or 3-year manufacturer's warranty, buyers of the Portégé have to be content with a meager 12-month on-site-service. In return, an upgrade to a total period of 36 months turns out to be relatively inexpensive and burdens the wallet just 69 Euros (~$94). 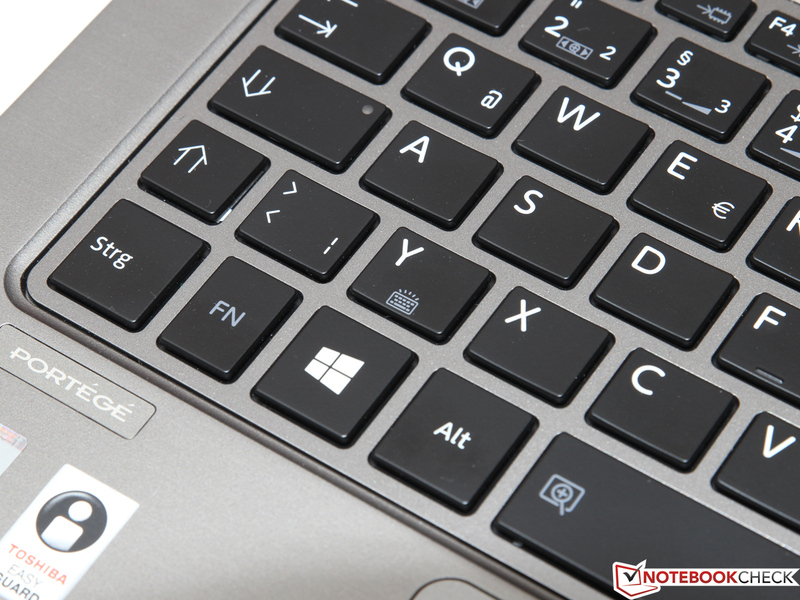 Toshiba fit the Portégé with a splash-proof chiclet keyboard that is lit by white LEDs (only on/off) in the dark. 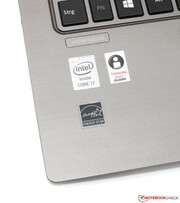 Distinct key labels and an intuitive layout ensure the user gets quickly accustomed, although some function keys (e.g. shift or circumflex) are for our taste too small. The letters, on the other hand, have the standard measurement of 15 x 15 millimeters, which is also known from bigger devices. 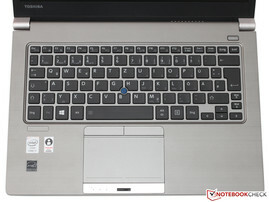 Apart from the slight recoil in the center, the keyboard barely gives cause for complaint during practical use. The pleasantly tight and crisp keystroke supplies the user with a precise feedback about every single input and therefore helps to achieve a high writing speed with a low error rate. When typing vigorously though, the keyboard makes a clearly audible clattering sound, which we would have welcomed to be a little bit more subtle. 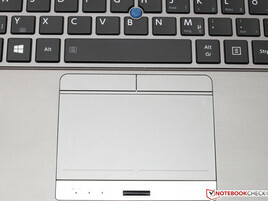 First, let us have a look at the big 10 x 5.6 centimeters (~3.9 x 2.2 inches) touchpad. Precision and gliding characteristics of the input surface are quite impressive in comparison with the competition. 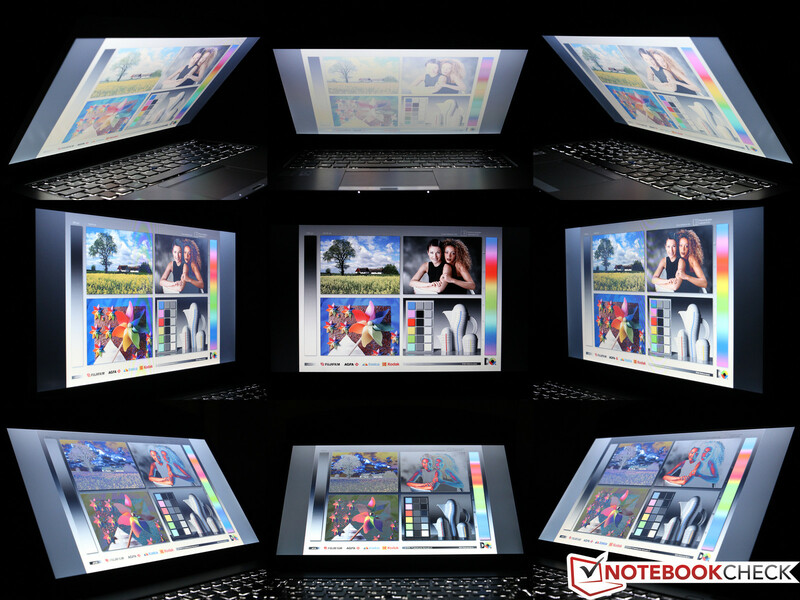 Furthermore the pad excels with numerous setting options and multi-touch gestures. On a less positive note, the manufacturers decided to deploy a so-called ClickPad without dedicated mouse buttons - especially for right-clicks we miss a clearly defined pressure point. 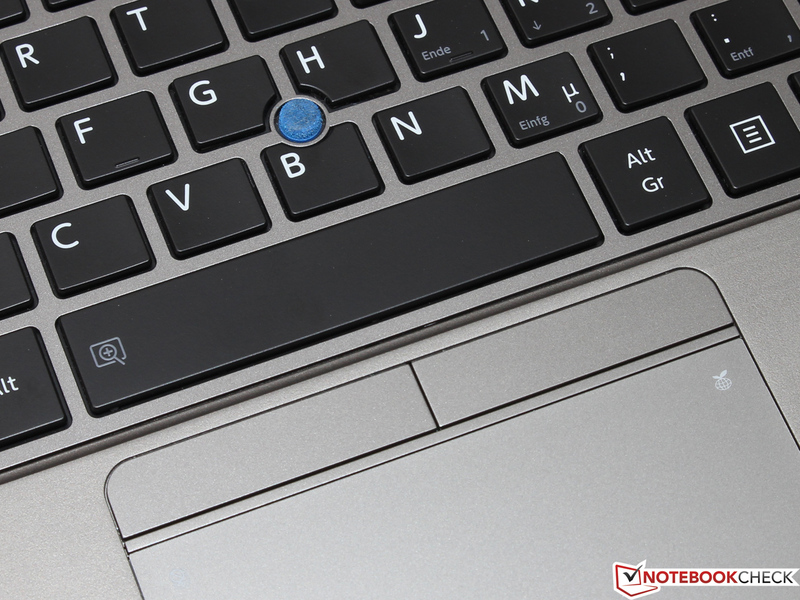 Thus, there is still the alternative for business notebooks: The characteristic TrackPoint, which Toshiba also calls AccuPoint. Once the user has become accustomed to the functioning of the small joystick, he will find it an ergonomic and equally precise substitute for the touchpad. 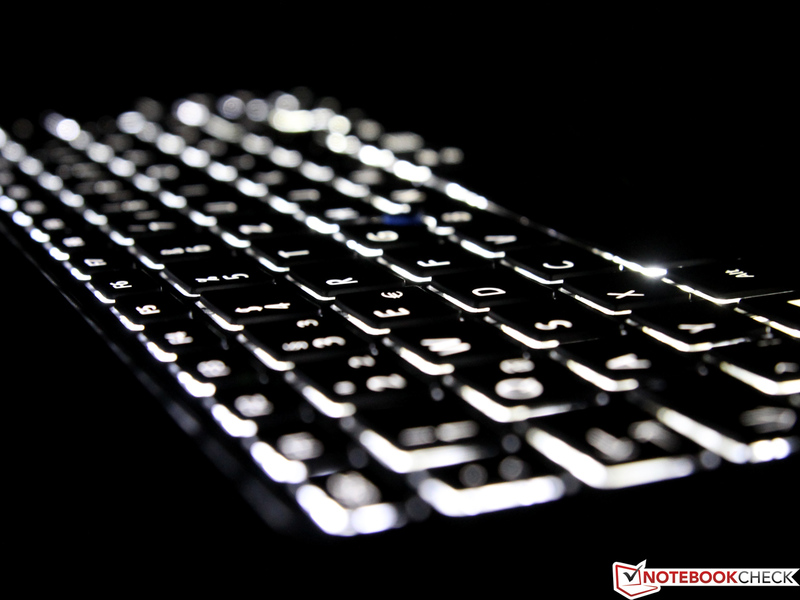 Furthermore, the associated keys delight with their tight and direct keystroke - that is what we expect to see in a professional device. On its 13.3-inch wide diagonal, the screen displays a WXGA resolution of 1366x768 pixels, which corresponds to a pixel density of 118 dpi. 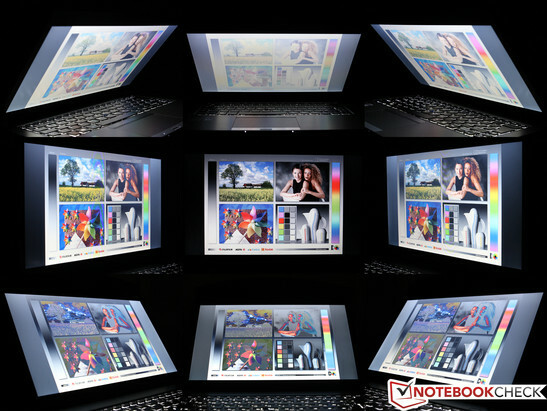 In comparison to several ultrabooks, which offer 1920 1080 pixels (166 dpi) at the same display size, this is not groundbreaking - nonetheless we would describe the screen as sufficiently sharp, especially since a smaller resolution improves the legibility of smaller writing and symbols. In the datasheet, the manufacturer boastfully promises a "high-brightness display", without giving any specific information about the attainable luminance density. In our measurements, we were able to determine an average value of 265 cd/m², which places the Z30 far behind the ThinkPad X240 (340 cd/m²). 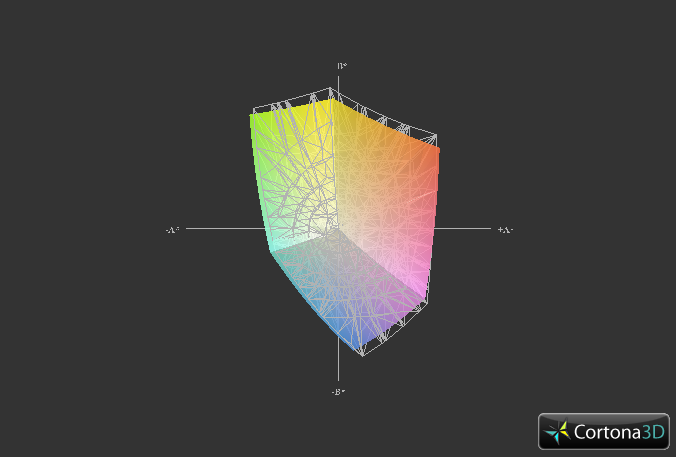 Although in absolute terms, a brightness of over 250 cd/m² is still regarded as quite decent, particularly since the monitor comes with an anti-glare surface which is typical for this range. The minor dimming at the lower edge (see measured values) is barely noticeable in everyday life. 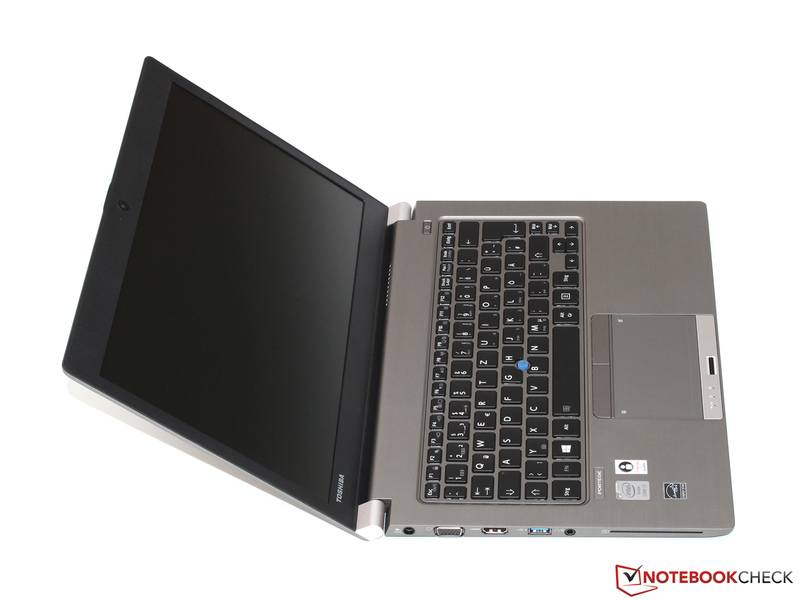 Unlike the candidate by Lenovo, which is optionally also available with a high-grade IPS display, Toshiba's Portégé is solely offered with the in-house TN panel TOS5091 - we are already familiar with the model from other notebooks such as the Satellite Z930. Although the black value (0.8 cd/m²) and therefore also the contrast ratio (338:1) have somewhat improved with respect to previous tests, premium quality surely looks different. 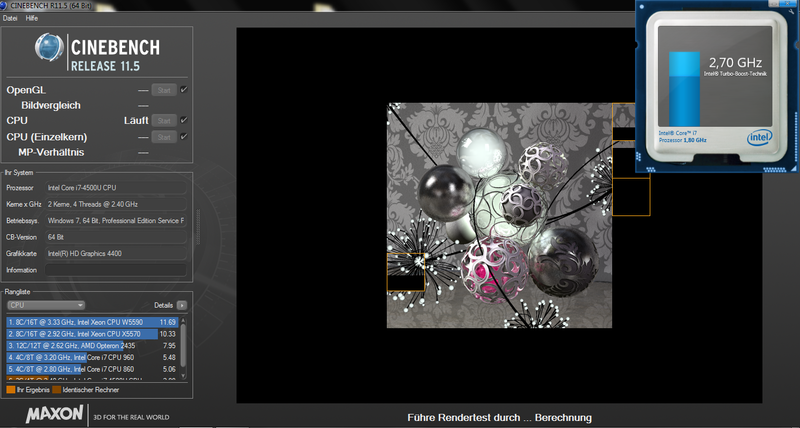 The Z30 was neither designed nor is it especially suitable for professional graphics applications. On the one hand, this is owed to the heavily limited color space, which similar to the X240, only covers a fraction (58 percent) of the important sRGB standard. On the other hand, the deviations of colors (Delta E 9.0) and grayscale (Delta E 9.8) are relatively high and therefore the picture has an overall visible blue cast - poor conditions when working with Photoshop & Co.
After all these quite negative impressions it needs to be emphasized that the display also has good features: Due to the respectable maximum brightness - which is not even lowered in battery mode - and the matte coating, the picture stays free of reflections and is always well discernible during outdoor use. It is only under direct sunlight that the display looses the battle against its surroundings; in this case, it is advisable to slightly turn the monitor or simply operate the notebook in the shade. ... and in the (half-) shade. 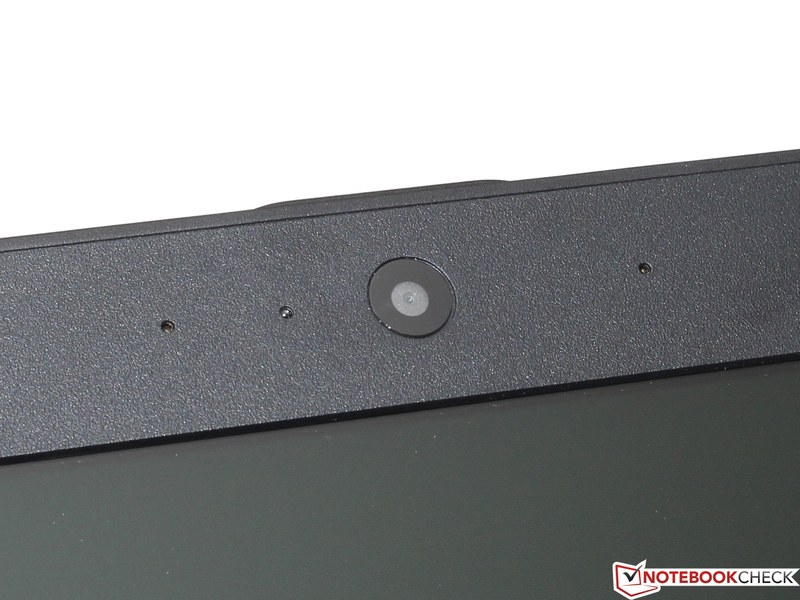 Informed readers will know that TN panels as a rule give no reason to expect stable viewing angles. The Z30 gets in line with the devices that confirm this preconception: Especially in the vertical direction the display tolerates only minor movements before a drastic loss in contrast and image distortions appear. An external monitor remedies this deficiency; not only does the digital HDMI output provide a flicker-free and sharp signal, but also the analog VGA interface (up to a maximum of 1920x1200 pixels). The limited reserve cooling capacity of the slim 13-inch case necessitates the use of economical ULV processors with a TDP of 15 Watts. 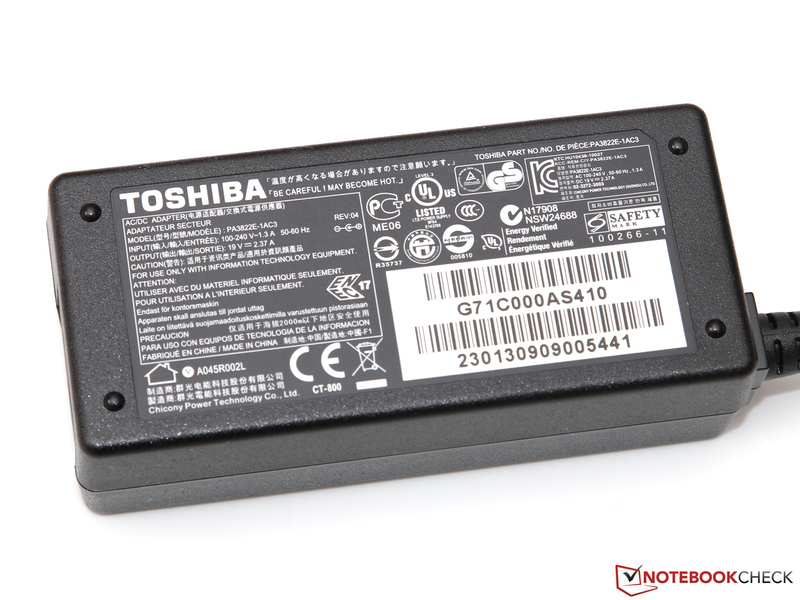 Up to now, Toshiba offers in its catalog merely the Core i5-4200U as well as the Core i7-4500U, of which the latter is installed in our test sample. 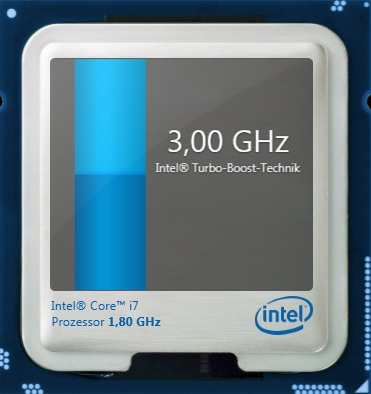 Based on the current Haswell architecture, the i7-4500U integrates two cores, which have a base clock rate of 1.8 GHz. Depending on the workload, the CPU can spark off a turbo boost up to 3.0 GHz (two cores: 2.7 GHz) and further profits from the Hyperthreading technology, which allows the parallel processing of a maximum of four threads. For more details, please see our CPU database as well as the background article about the fourth generation of the core architecture. 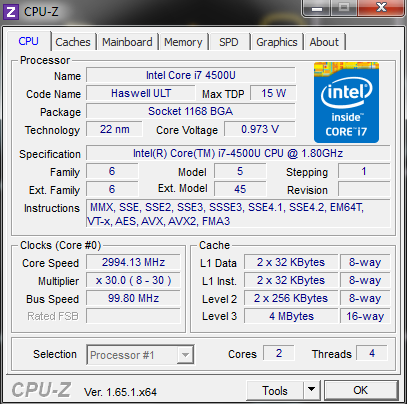 The processor integrated HD Graphics 4400 is responsible for graphics computations. 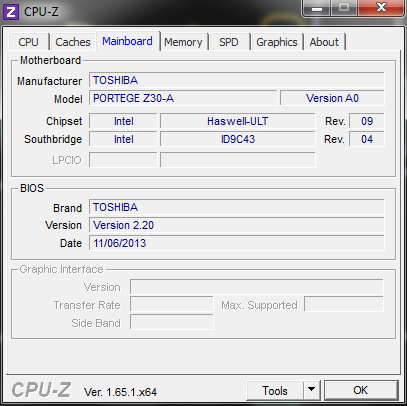 The medium configuration level of the Haswell GPU, which is also known under its abbreviation "GT2", clocks at 200-1,100 MHz and should be sufficient for simple 3D and multimedia applications. 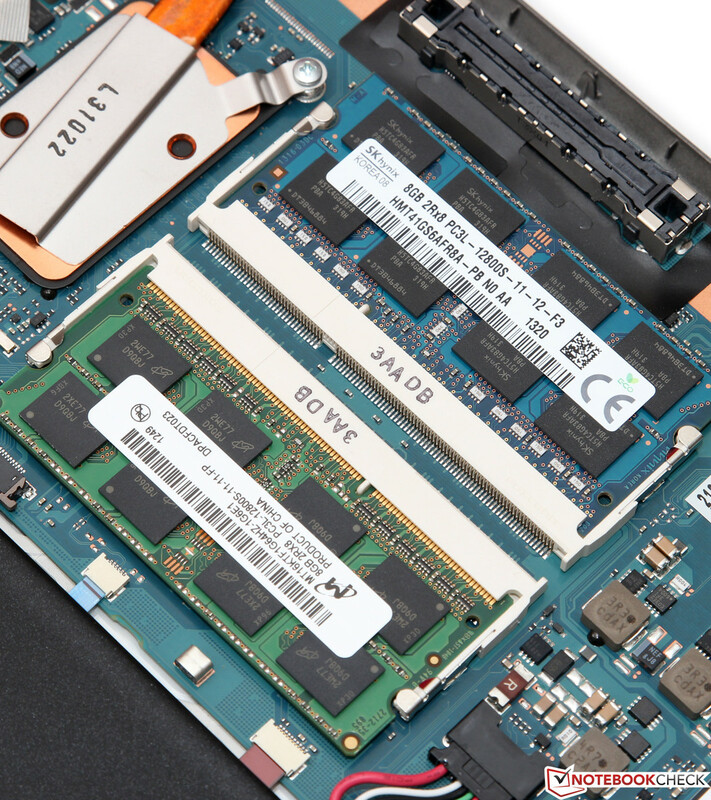 With an impressive 16 GB main memory, or to be more precise 2x 8 GB DDR3L-1600 in dual-channel mode, our sample is all set for extremely memory-intensive software. Programs and user data are stored on a 256 GB SSD, which we will go into detail about later on. 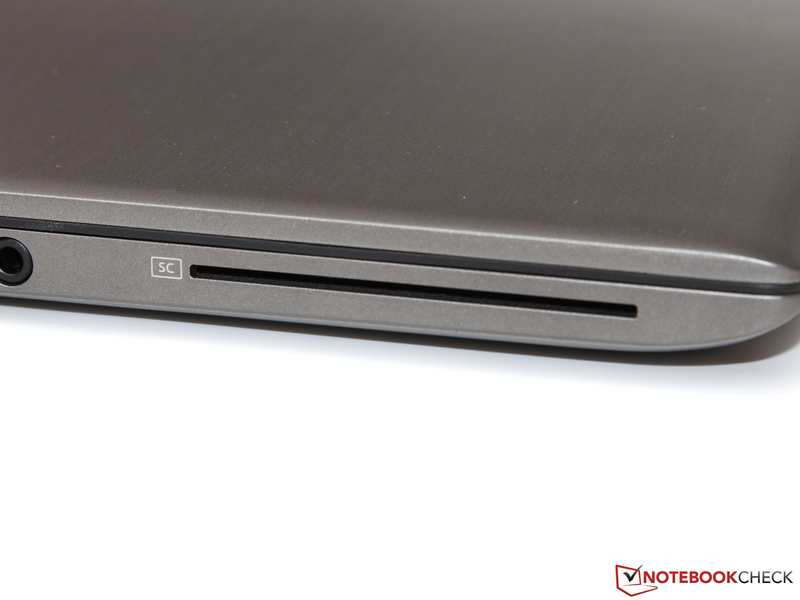 Our benchmarks attest the Portégé performance at the upper end of what the Core i7-4500U is capable of. Due to almost optimal exploitation of the specified turbo boost leeway, even the ThinkPad X240 with its nominally more powerful i7-4600U (2.1 to 3.3 GHz) is beaten in some measurements. Likewise noteworthy is the consistency of the performance: Even during longer benchmarks or in battery mode the clock speed remained unchanged at a high level. In comparison to the Core i5-4200U the Core i7-4500U carves out an advantage of about 15 percent which, given the significant price difference, does not appear to be particularly much. Those who choose the smaller processor (and otherwise identical features) currently save almost 200 Euros (~$272) - an amount that is possibly better invested in a warranty extension or the previously mentioned docking station. 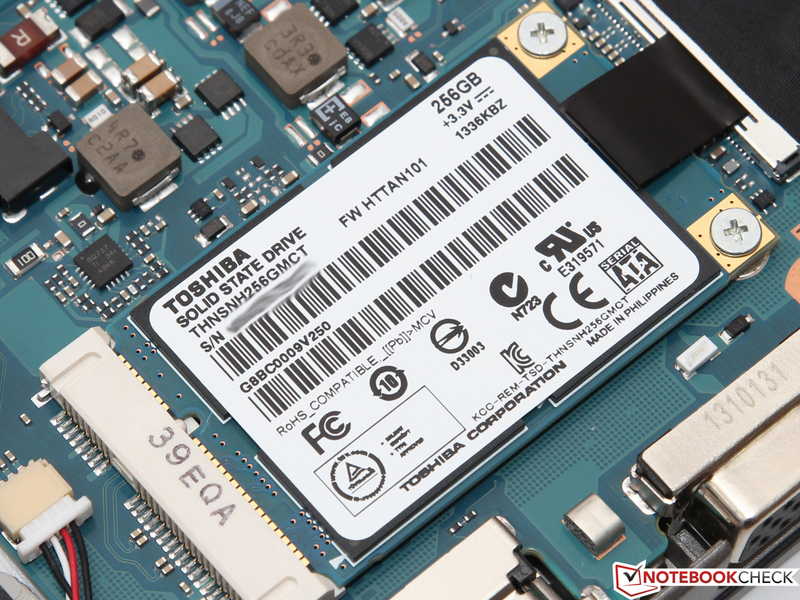 The 256 GB SSD (of which 165 GB are free) is a model in the compact mSATA format, which derives from Toshiba's current HG5d series. We have previously tested the same drive, which incidentally relies on a Marvell controller and MLC-NAND in 19 nm production, in the 2.5-inch format, where it was convincing, exhibiting high performance and low power consumption. 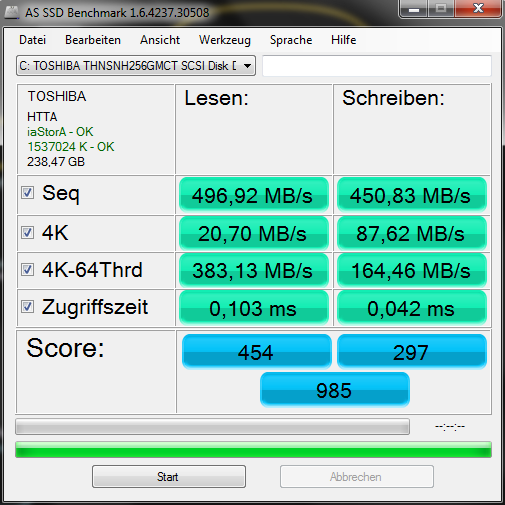 The mSATA version is in no way inferior to its bigger brother and attains similarly high sequential transfer rates of almost 500 MB/s. In the 4K measurements and at copy operations the model proves to be even quicker and competes with the Samsung SSD 840 Pro. 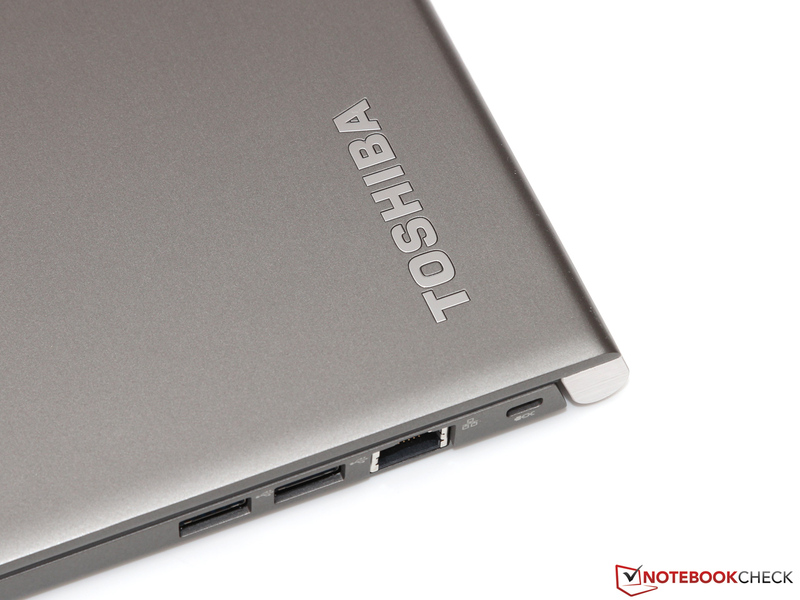 The latter is currently considered the benchmark in the SSD segment, which emphasizes the performance of the Toshiba drive even more. With simple day-to-day tasks like using MS Office or browsing, the subnotebook almost seems to be unchallenged - even more demanding programs and excessive multi-tasking are mastered without batting an eye. 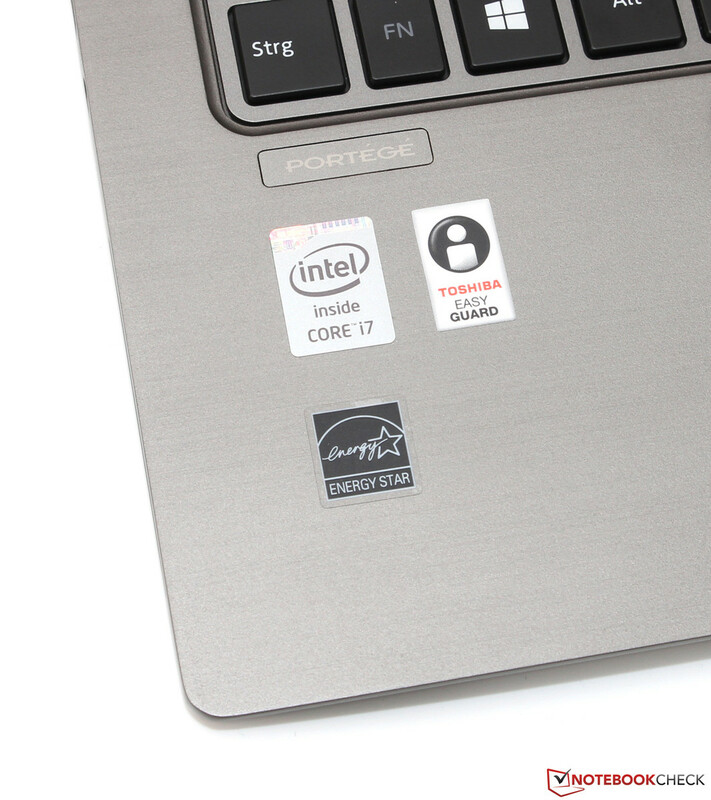 This is also reflected in the PCMark 7 in which the Portégé places itself with 4,812 points just in front of the competition from Lenovo, Dell and Sony. Such minimal differences should, however, not be overrated and can partly be attributed to measuring fluctuations. 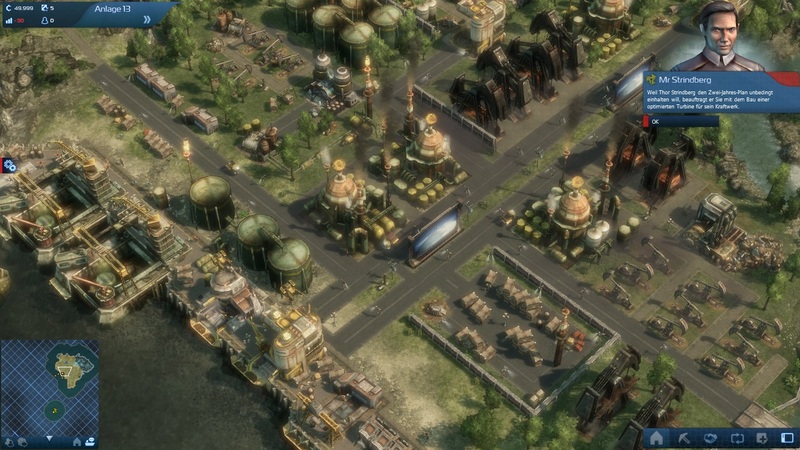 Intel’s graphics chips have undergone an astounding amount of progress in the past years. Persistent performance improvements and continuously optimized drivers are the reason that current models such as the HD Graphics 4400 are even a threat to entry-level graphic accelerators. Due to dual-channel connection and the comparatively high clock speed of 1,100 MHz (which turns out slightly lower in the Core i3 and Core i5 CPUs) we ascertain in the 3DMark 11 a GPU score of 910 points - this puts the HD 4400 ahead of a Radeon HD 7570M and about level with a GeForce GT 620M. 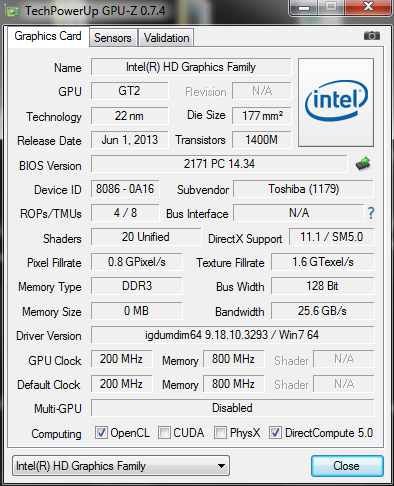 Haswell also has, besides the quite decent 3D performance, a few interesting features like Quick Sync to offer. Furthermore, the hardware decoder/encoder introduced in the Sandy Bridge generation works even more efficiently now while simultaneously further improving image quality. 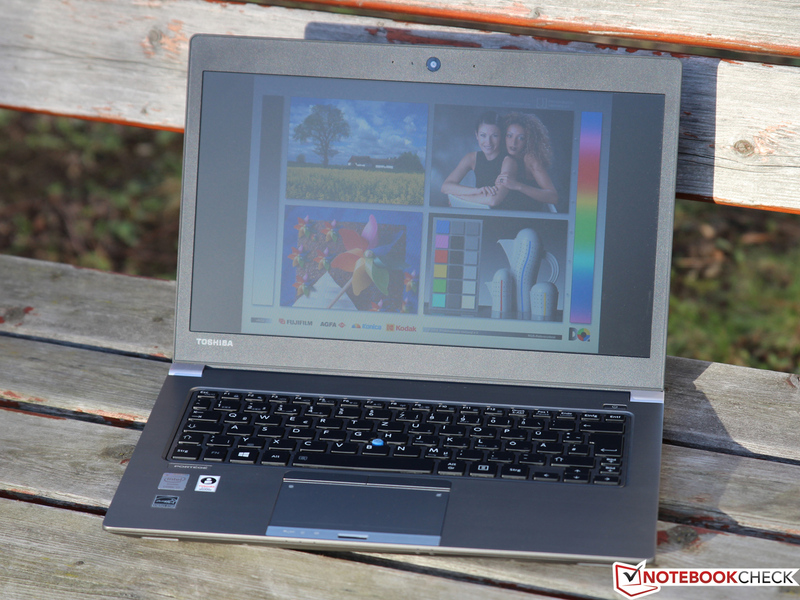 Games are certainly not the intended use of the notebook, although the HD Graphics 4400 is able to handle many current titles with smooth frame rates. 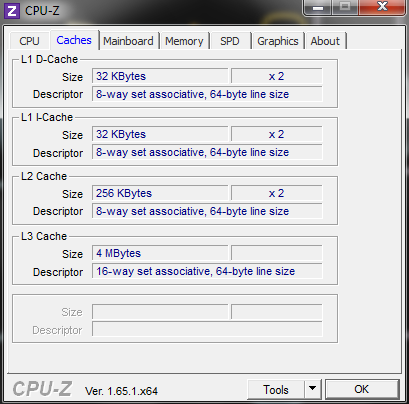 In graphically less demanding games such as Diablo 3 or Dota 2 the Z30 easily reaches 30 fps and more with medium details and native display resolution, whereas BioShock Infinite or Tomb Raider judder noticeably at such settings. Current action hits like Battlefield 4 can only be played to a very limited extent with a graphics card in this performance range in general. In idle mode and under low load the fan of the Portégé often shuts off completely which results in an inaudible overall system. Even when the cooling system starts up briefly, which happens occasionally, for example, during the playback of HD videos, the noise level remains at only 31.6 dB(A); pleasantly low. 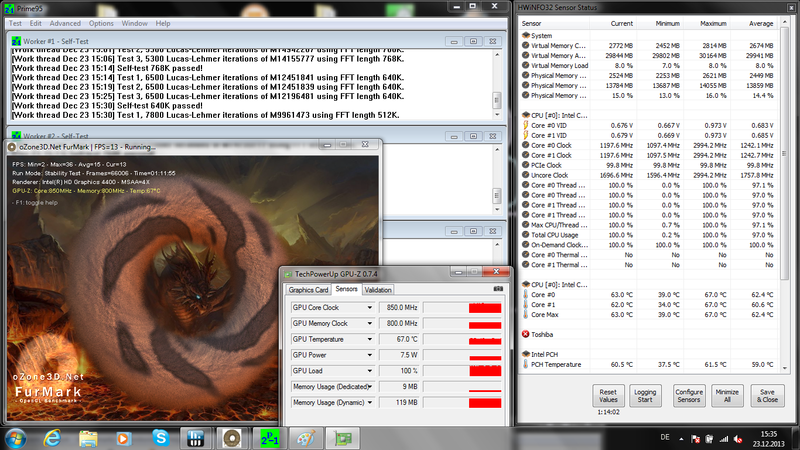 The tide turns, however, as soon as an application permanently stresses the processor and/or the graphics card. 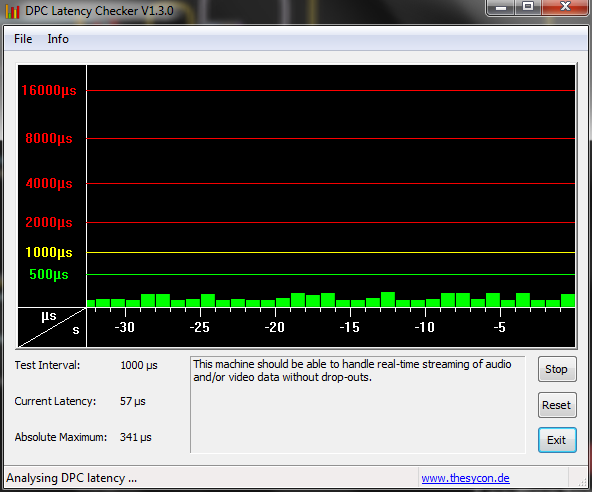 After a few minutes the volume rises to a clearly audible 41.5 dB(A); in our stress test even up to 44.2 dB(A). This is accompanied by a very high frequency noise characteristic that really gets on the user's nerves. Nevertheless, we would like to point out that this solely applies to the maximum load mode, which is only rarely encountered in practice. 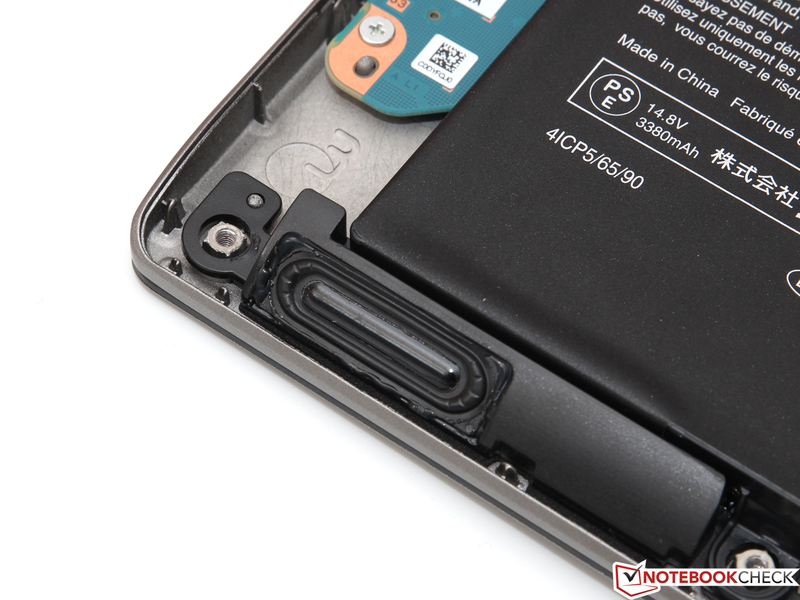 No matter if in idle mode or in the stress test: Unpleasantly high case temperatures are not a problem with the Z30. Even at maximum load, there is only a small area around the rear-facing fan outlet that shows a noteworthy temperature rise, reaching just above 40 °C (104 °F). Thus using the notebook on your thighs is, even for longer periods, possible without restrictions. 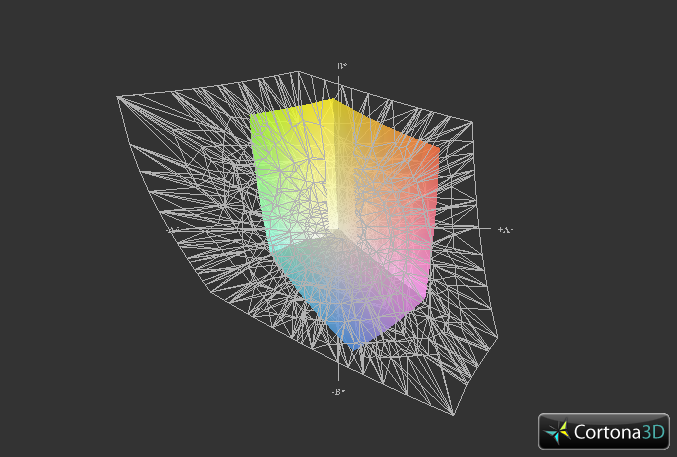 It turns out that the temperature development inside the case is equally impressive. 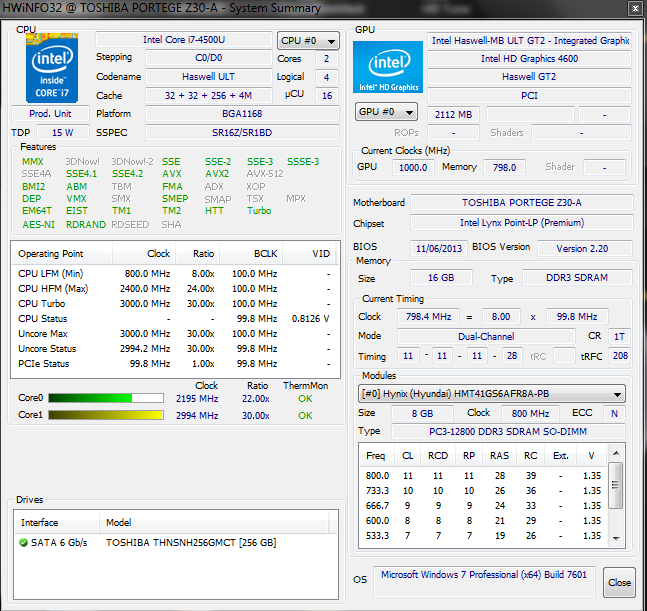 After an hour-long parallel execution of Prime95 and FurMark the Core i7-4500U reports values between 62 and 67 °C (143.6 and 152.6 °F) - according to Intel up to 100 °C (212 °F) would be permissible. Thus, even during hot summer days there remain ample reserves. 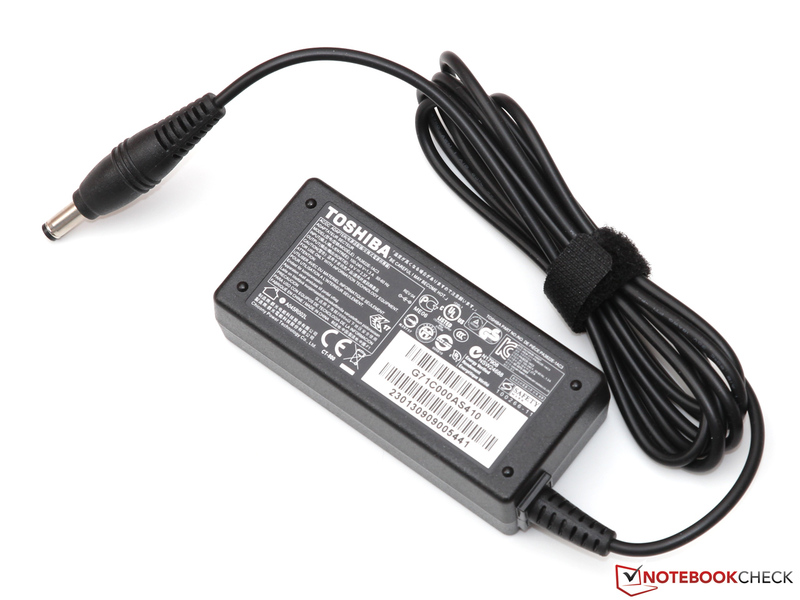 Toshiba might also give it some thought to restrain the somewhat overzealous fan. 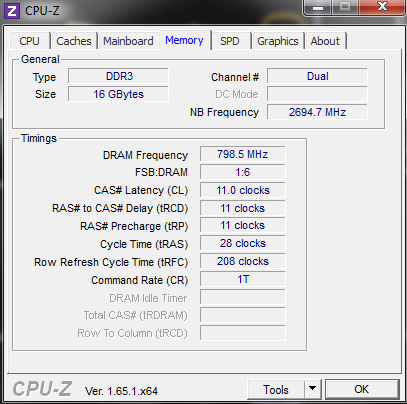 When having a look at the clock speed it is irritating at first that the processor is throttled to a meager 1.2 GHz, however this can be explained with the low TDP of the chip. In return, the graphics unit is allowed to raise its frequency to up to 850 MHz, which ultimately provides better performance in 3D intensive applications. (+) In idle usage, the average temperature for the upper side is 25.2 °C / 77 F, compared to the device average of 30.7 °C / 87 F.
The stereo speakers, which are hidden inside the case, are well suited for playing back simple system sound or speech, since they provide a very clear high-frequency range and an acceptable maximum volume. The boxes exhibit weaknesses, however, when it comes to movies and music: Bass is practically non-existent, which is why an external sound system should be connected for such multimedia applications if possible. This can be done via either the HDMI output - which, however, requires an appropriate receiver - or the classical way via jack socket. The ULV models of the Haswell platform offer an impressive potential concerning the reduction of the power consumption in idle mode. 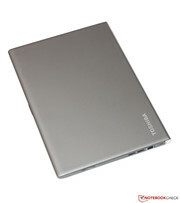 The Portégé requires not more than 3.5 to 7.1 Watts with an inactive Windows desktop and is therefore even a little bit more efficient than the ThinkPad X240 by Lenovo (3.9 to 7.3 Watts). 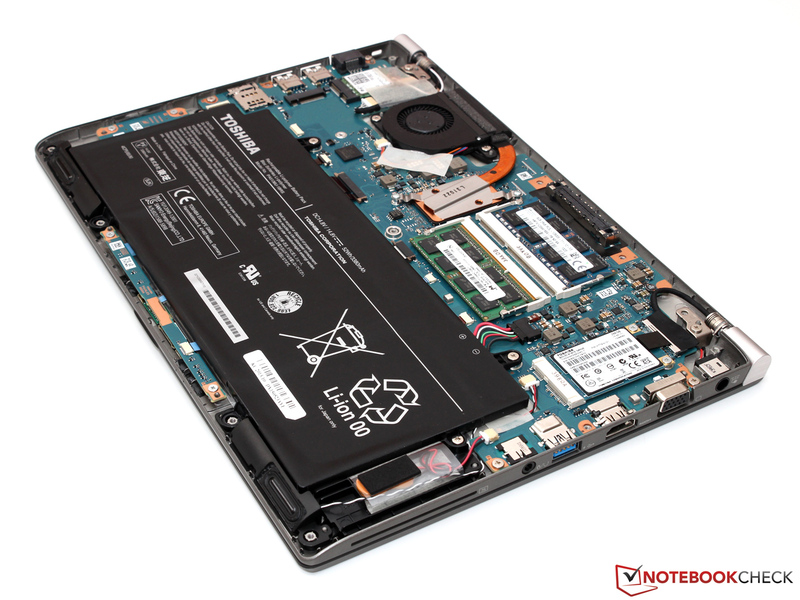 Even the most frugal notebooks based on last year's Ivy Bridge architecture needed a few Watts more in our tests. 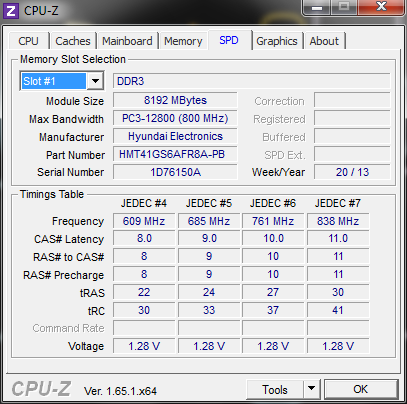 By lowering the TDP from 17 (Ivy Bridge) to 15 Watts (Haswell) the consumption under load turns out to be slightly lower in current models as well. Our test candidate is content with a maximum of 27.6 Watts - such numbers even make the small 45-Watt power supply look almost oversized. 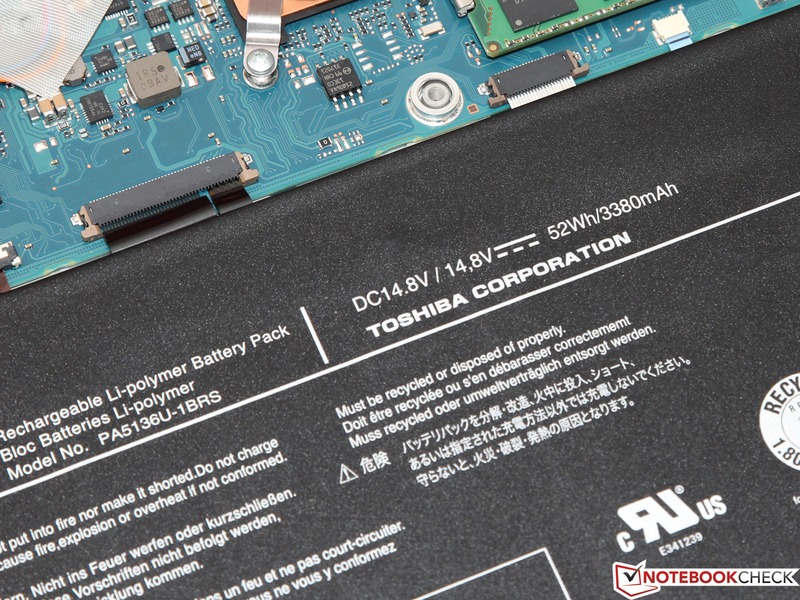 The extremely low consumption during idle combined with the 52 Wh battery, which is integrated in the case, allow downright phenomenal runtimes: Running 19 hours and 55 minutes in the Battery Eater Reader's test (energy-saving mode, minimum brightness, WLAN deactivated) the Z30 even pulverizes the manufacturer's information which states only 12 hours. Even the Dell Latitude E7240 (almost 8 hours) or the X240 (almost 14 hours) cannot keep up with such a runtime. Significantly shorter, but still at an excellent level, is the endurance in the WLAN test with adjusted display brightness (about 150 cd/m²). In this practical scenario, the user can browse the Internet for 7 hours and 37 minutes until the battery's reserves are drained. At full load in the Battery Eater Classic test (high-performance, maximum brightness, WLAN activated) the device's various energy-saving features naturally help only little to prevent the runtime from shrinking, causing it to be 2 hours and 19 minutes. 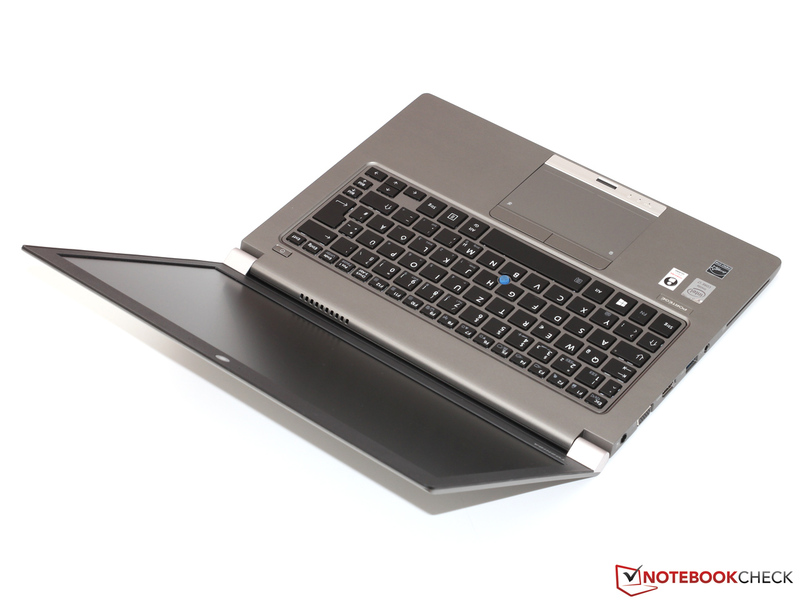 Once again, the value far exceeds most of its direct competitors and emphasizes the notebook's outstanding mobility capabilities. Charging the device calls for a little patience and is not completed until about three hours. 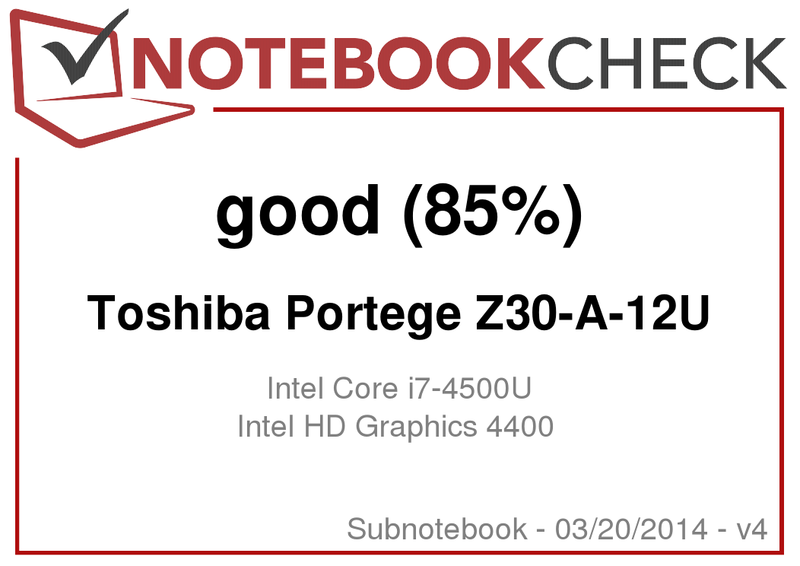 After our extensive test we would sign off this sentence in a heartbeat; "With the Portégé Z30-A high performance goes ultra-mobile", which was actually penned by a marketing employee from Toshiba. The objective target, to design an enduring, portable but still extremely powerful subnotebook for professional use, was brilliantly accomplished by the engineers of the Japanese manufacturer. Especially noteworthy is the lightweight and sturdy magnesium case, whose discreet look belies the inner qualities. And there are a lot of them: Fast hardware can admittedly also be found among the competition but only an exceedingly few models get close to the immense battery runtimes of the Portégé. Due to its matte and sufficiently bright display the notebook even cuts a good figure outdoors only to subsequently transform into a fully adequate business device on the desk via a docking station. 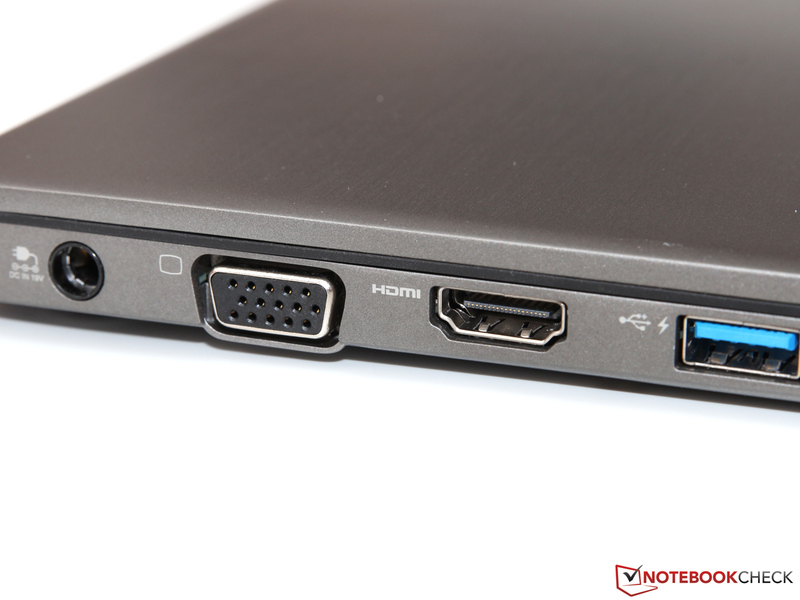 After all this praise we should not forget, however, that the manufacturer could also further improve some details: The just mentioned optionally available docking station is a nice extra but we would have preferred to have the DisplayPort output for high-resolution monitors directly on the notebook. This applies all the more since the quality of the internal TN panel is not very convincing. 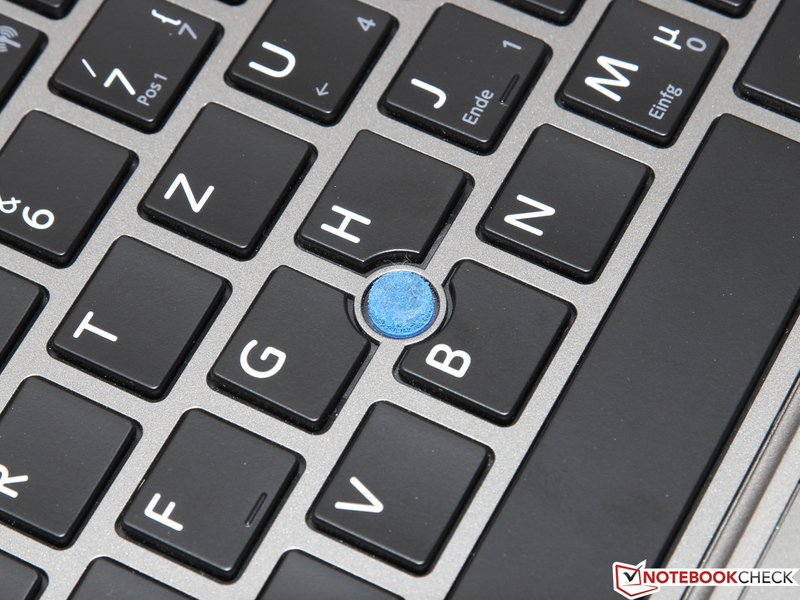 We also see potential - although in conclusion they are quite good - in the input devices: The keyboard should be reinforced in the center and the pressure point of the touchpad buttons optimized. Considering the purchase price of about 1,500 Euros (~$2038), these points of criticism are certainly justified. 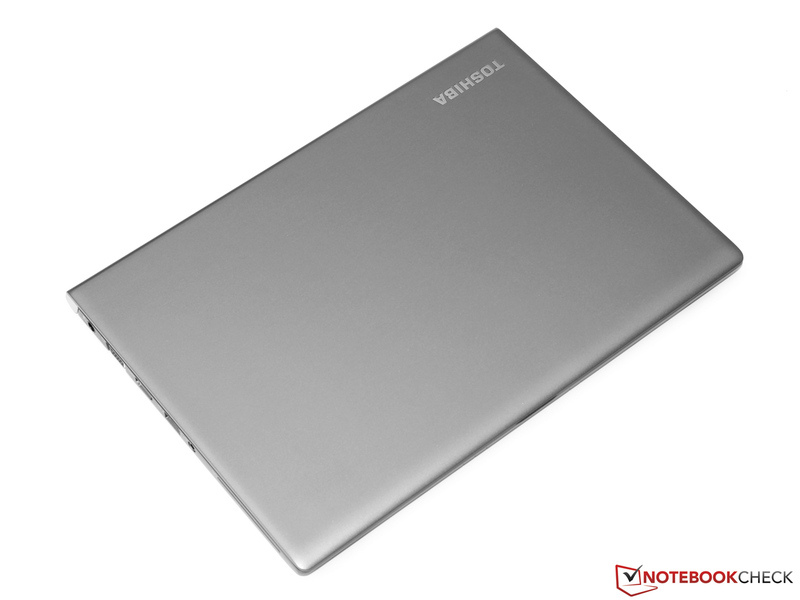 Finally, we would like to mention the likewise recommendable competitors: However, alternatives in the 13-inch segment are quite rare since many manufacturers either rely on the compact 12.5-inch or on the bigger 14-inch format. 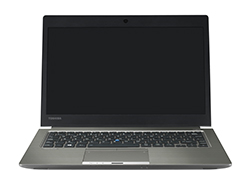 Besides HP and Dell, it is especially Lenovo that is well represented in both ranges and offers models like the ThinkPad X240 that offer a viewing angle stable IPS display. ...has a rather simple look. ...made of especially light and sturdy magnesium. 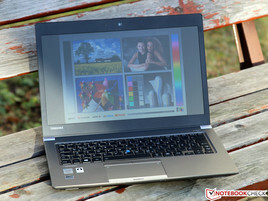 ...A meager weight of 1.2 kilograms similar to that of ultrabooks. 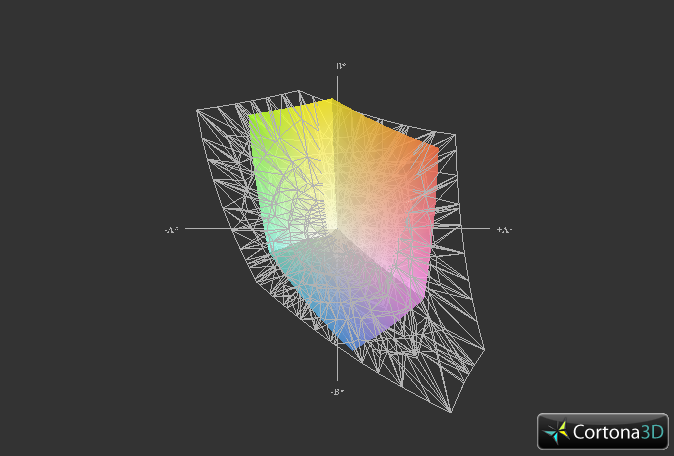 The very thin display can be slightly twisted however. ...could also be a little bigger. There is nothing to find fault with the workmanship. 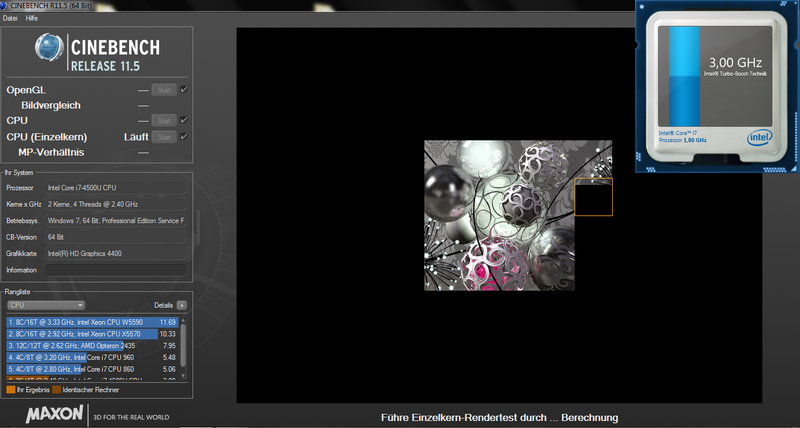 ...the interface diversity can be extended via a docking-station. 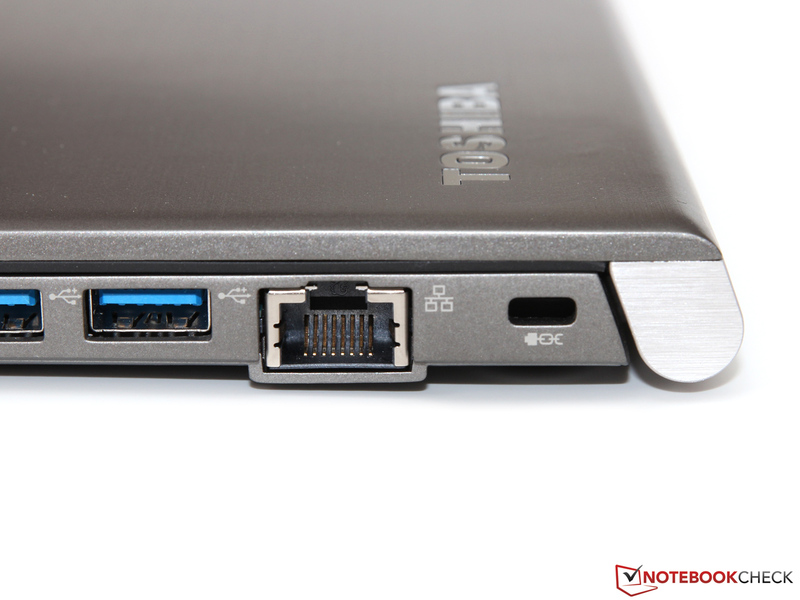 It is simply plugged into the bottom side of the notebook. Among the diverse safety features is also a Smartcard reader. ...is dissipated at the back side. 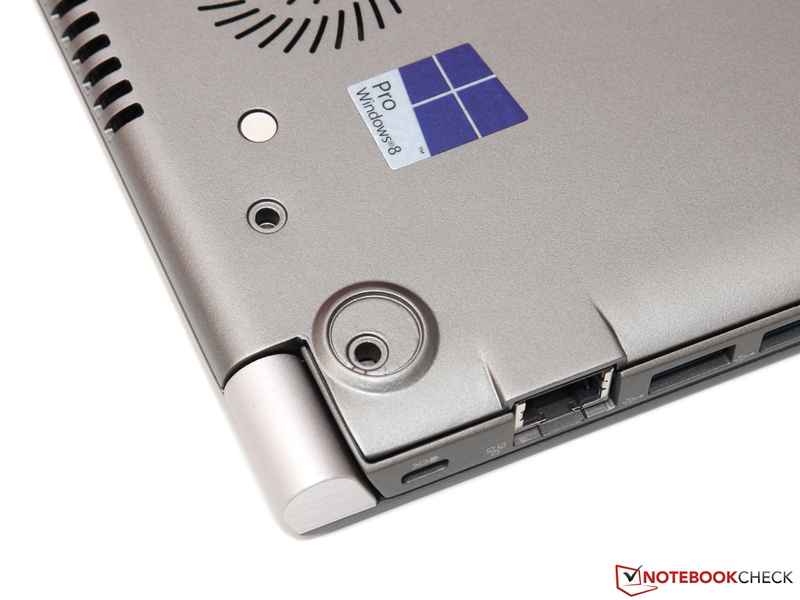 ...is simply a must-have in a typical business notebook. 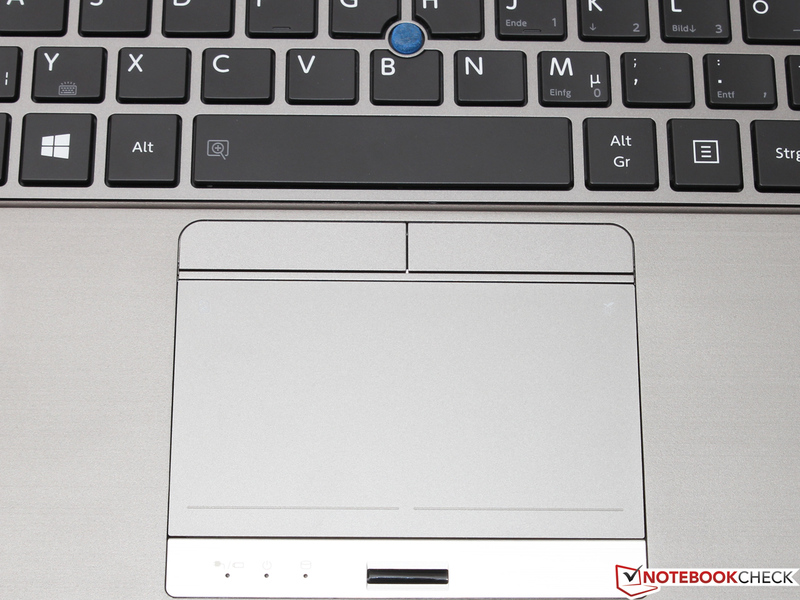 The small stick is an attractive alternative to the touchpad. ...and is lit by white LEDs. For video chats there is a 2.0 megapixel webcam. ...some hidden screws need to be loosened at first. Now the base plate can be removed. ...as well as the WLAN adapter. The fan can be removed and cleaned. ...with a power of 45 Watts comes into operation. A compact, light and powerful device, the Portégé is the optimal everyday companion for everyone that needs to have their business device always on hand. But it also cuts a good figure on the desk due to its optional docking-station. 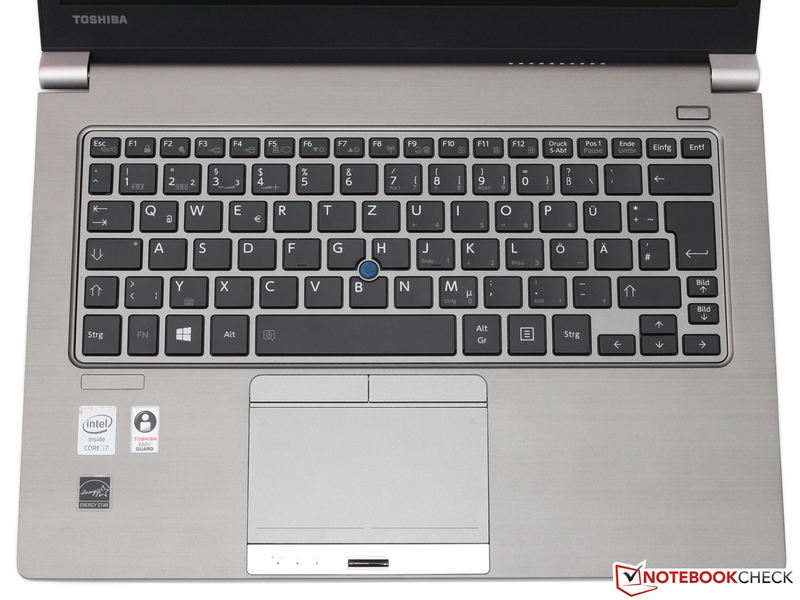 Minor improvements such as a high-grade IPS panel or a more sturdy keyboard would have given the notebook the last touch, which we missed on some occasions. However, the manufacturer did not make any grave blunders. Impressive what runtimes the Z30 is able to tease out of the not excessively big 52 Wh battery. On the one hand this is due to the frugal Haswell CPU but on the other hand this testifies a highly efficient and carefully balanced overall system. 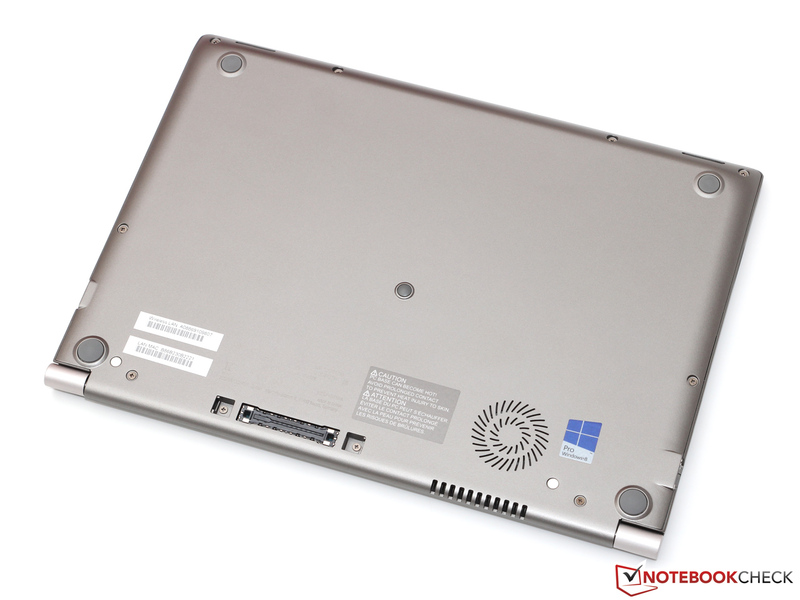 Among the competitors are the Lenovo ThinkPad X240, Dell Latitude E7240, Sony Vaio Pro 13, MacBook Pro 13, Fujitsu LifeBook S904 and HP EliteBook 820 G1.